Why pay $4 a pint for kombucha? Explore everything about kombucha (a fermented tea beverage) and why fermented foods are so good for you. 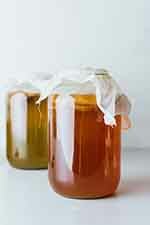 Learn how to make it safely at home, and sample various seasonal kombucha flavors. Make a bottle, carbonate it, and taste it within days. Discover what you need to start making kombucha at home, and where to buy the ingredients and supplies. Single batch and continuous brew is deeply covered.